When I first started paying attention to the nutritional value of my food choices, I didn't know how to cook, and would have told you that I was a "picky eater" who "didn't like" many different foods. When I was diagnosed with severe vitamin and mineral deficiencies, it was obvious that my regular food choices just weren't healthy enough, and my husband encouraged me to start experimenting with different foods and different recipes and - gasp - learning how to cook them myself! After a few months, it turned out that I actually was NOT all that "picky" (just too stuck in my ways to be willing to experiment), and that there were many options that I DID like when prepared / cooked differently. While I did confirm that I really dislike mashed foods of any kind (it's a texture thing), I learned that I adore almost all root veggies (rutabagas, turnips, parsnips, beets, radishes, sweet potatoes) when they are roasted, and that even potatoes aren't all that bad (I was never a fan). The biggest shock to me was discovering that I absolutely love green beans! They were way up there on the "ew - gross" list after growing up having them boiled past belief, and finding out that they are delicious when lightly steamed or roasted was really eye-opening! I still am not a big fan of avocado or eggplant (they're far too "meh" in my opinion to justify their cost), but I can certainly tolerate them now if someone serves them. If you can find them locally, I recommend Medjool dried dates. They are meatier and plumper than a variety that is grown in California. The Medjool is on the left. One thing I have recently discovered since going vegan are the soft moist dried figs. They taste absolutely like candies but give you so much less calories and so much more fibre that the next day is shows nowhere and you feel just as fit as slim as before (unlike after binging on sugary treats). 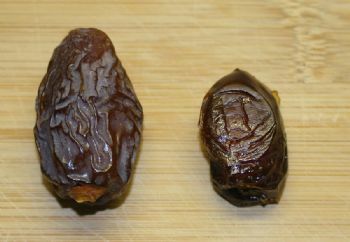 Also the moist dried dates are great but I like figs taste better. I strongly recommend. lots of green veggies~Brussel Sprouts, broccoli, spinach, Romaine lettuce,Bibb lettuce,butter lettuce. tofu.....even a year ago, I could never bring myself to try it again. then I found the secret is in making it with a little sauce and plenty of other veggies. Now I have it 3-4 times a week. I have always liked healthy foods like fruits, vegetables, etc. I guess I have learned to make sure I am eating them in appropriate quantities every day. I am willing to try things, too, that I don't enjoy, like eggplant and sweet potatoes. I can tolerate eggplant in teeny, tiny if it's covered in red sauce and sweet potatoes are alright when seasoned with curry type flavors. Mostly, I don't force myself too much because I know I enjoy enough other healthy things that I don't have to consume things I don't usually like. Since you decided to learn to live a healthier lifestyle, what are some foods you now enjoy eating that maybe you didn't like when you started out. When I started my journey, I wasn't a big fan of leafy greens. With time, I learned to enjoy dark leafy greens like kale, swiss chard or beet greens. My green veggie for years was broccoli or peas. Avocados. I didn't even really eat guacamole. Avocados are something I learned to enjoy. Now, if I see them on sale (which I did this week), I'll buy a couple to slice in salads.